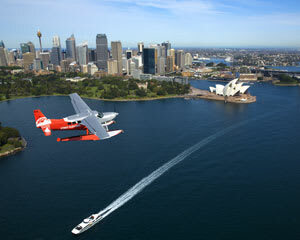 For a truly unique adventure, combine a scenic seaplane flight with a romantic beach picnic. An amazing and uniquely Sydney experience. Experience a slice of Sydney’s past on historic Shark Island. Shark Island gets its name from its shape - not its wildlife! Small and perfectly positioned, it is located at the mouth of Rose Bay in the Sydney Harbour National Park and is the perfect destination for a weekend picnic. Following your Sydney Seaplane flight over the island, our water taxi will drop you off with a delicious brunch picnic hamper with wine. Choices for a picnic spot abound as the island offers stunning views right down the mouth of Sydney Harbour to the city. Return water taxi transfer to Rose Bay is included. We require a minimum of 2 people to confirm a flight. Departs 11:00am. Impressive This adventure will alter your idea of what adventure is all about. You'll need to come with an open mind and be ready to take in all the sights, smells and sounds. The experience will be what you make it to be! Fresh pastries and breads, fruit salad, gourmet meats and smoked salmon, a cheese selection, juice and wine.